Sonia, tell, please, how did you come to armwrestling? – I entered the armwrestling 12 years ago. Once we saw armwrestling competition and asked one of my brothers to take part in it, there because he was very strong. He competed and won... I wanted to compete but that day they did not let me, because there was no female category. So wait a few months for a tournament with female category, pulled there and won. So I asked other sportsmen and they told me where to train and learn the technique. From that moment I fell in love with this sport. It is so cool that two of my three brothers and my father also joined this world. My younger brother managed to always be among the top three positions both in provincials and nationals, so Michael won the junior national in 2013. But the one who is always with me at championships and trainings is my father Juan Antonio, more known as "the grandfather". 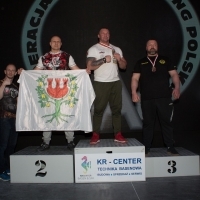 Last year he appeared in the Worlds in Hungary, senior grandmaster -75kg class, and he won a 4th place on right and 2nd place on left hand. Currently I train with my father, Jaba Getiashvili (Georgia) and Ivan Portela. They are my teachers in armwrestling. – I am not a competitor who has won Worlds or Europeans, but that is my purpose – to go up to podium and say: “I got it”. And I do not give up. It is so immense pleasure to practice this sport that I will never get tired of training or teaching anyone who wants to learn. My titles – 12 times champion of Catalonia, 12 times champion of Spain, several international titles. This year I pulled at the Supermatch and the Gladiators night, previously I got two 6th places in World championships in Poland 60kg senior class and in Lithuania senior 55kg. What do you do besides armwrestling? – I am delighted with my job, as I am bus driver. What is your training look like? – I train six times a week: two days bodybuilding, two days of working at the table, one day cardio and one day stretching. What do you think about upcoming Zloty Tur and Vendetta? – Actually, I would like everyone to win because it is very hard to be a champion. About Vendetta pairs – they all are great professionals and great athletes, real role models! Gennady Kvikvinya: "It will not be so easy to defeat Tim"